Not that anyone should actually sit down and write a report on these, but I'm writing about them because they're the best damn posters I've seen all year - and they're for a movie that doesn't even come out this year! 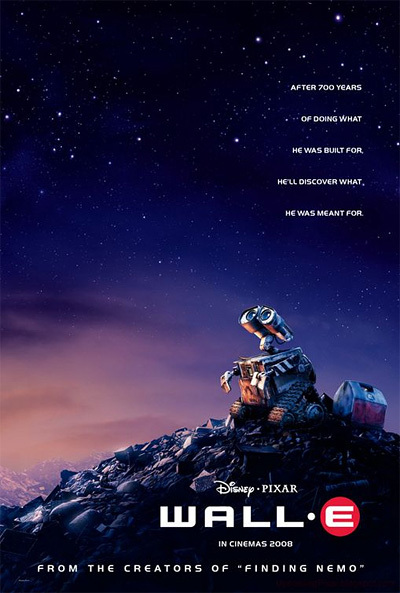 The latest poster for Pixar's next film Wall-E, due out next summer, comes courtesy of Upcoming Pixar. The first one arrived in September, and was already one of my favorites. Now that there are two posters out, I can easily say that these are two of the best teaser posters ever. I'm guessing part of this has to do with the character Wall-E to begin with. The lil' bugger is just so god damned cute! And the fact that they're capitalizing on that is what makes these so great. If you've seen the trailer then you know how Wall-E acts, and they've managed to capture that personality and emotion perfectly in the design. I'm a sci-fi fanatic to begin with, on top of being a huge Pixar fan, and you combine those two with some incredibly well designed teaser posters and now I'm praising these like they're the best things since sliced bread, but fortunately that's true. Without any further delay, here they are. Now if only I could get my hands on a few copies of these, maybe give away a couple to some readers. I have a feeling Wall-E may end up being my favorite Pixar movie in a long, long time. At least that's how I feel right now, but we've still got to see a real trailer and hear more of the story. 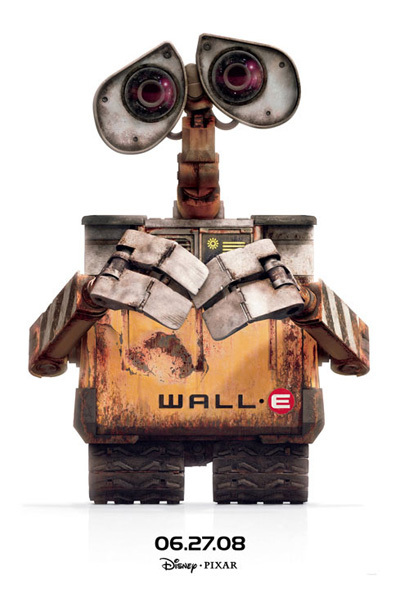 Wall-E is both written and directed by Pixar's Andrew Stanton, who wrote and directed A Bug's Life and Finding Nemo. The film arrives in theaters on June 27th, 2008 next summer. This does look like another fantastic pixar movie! I saw Andrew speak about it (for the first time?) at this year's Comic-Con and boy was it impressive. From the few screen shots they showed and these new posters, its obvious the pixar team did their homework on the visuals of space, just like they did on the ocean with finding nemo. Cant wait. Still looks like a Super Deformed Johnny 5 crossed with a dash of E.T. I guess 20-something-year-old movies are fair game in these times of sparse originality in Hollywood; particularly with kids' Pixar films, where the core audience won't have a clue about the similarities with this and Short Circuit and E.T.